Open fires and stoves provide a welcoming focal point to a room as well as being an alternative method of heating your home. However they can increase the risk of fire in your home if they are not used or looked after properly or if chimney is not swept and maintained. Having your flue or chimney swept removes deposits which have built up due to the burning of carbon-based fuels, such as coal, wood, oil and gas. There is a clear and safe passage for gases caused by the burning process, which are combustible, thus reducing the likelihood of the chimney catching fire. 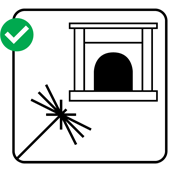 Mean that objects such as nests, cobwebs and loose brickwork, which could obstruct the chimney, are also removed. To find a registered chimney sweep in your area visit www.hetas.co.uk. Have the structural integrity of your chimney breast inspected, by a competent engineer, particularly in the roof space. This inspection is extremely important if you have a thatched roof. It will ensure that the chimney structure is sound and that sparks, fumes or fire cannot escape through cracks or broken brickwork. To find a registered structural chimney engineer in your area visit the National Association of Chimney Engineers website nace.me.uk.